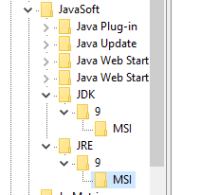 Between Java 8u144 and Java 9, there are significant changes to the data created by the JRE installer in the Windows registry. These changes will impact many existing applications, but are not mentioned in the JDK 8 migration guide. Applications that search the registry for the installed version of Java will fail, primarily due to the abbreviation of "Java Runtime Environment" used in Java 8 and previous releases, to the much shorter "JRE" used for Java 9. This is a very significant change and should not be omitted from the release notes. There is also one less key being created by the Java 9 installer, which is based on the full, rather than short java version string. Any applications relying on that will also fail. 1) A summary notification in the Release Notes "Important Changes and Information". 2) Migration details in the JDK 9 Migration Guide. There is no mention of this significant issue in any documentation. The most damaging aspect is that there was no advance information supplied prior to release.